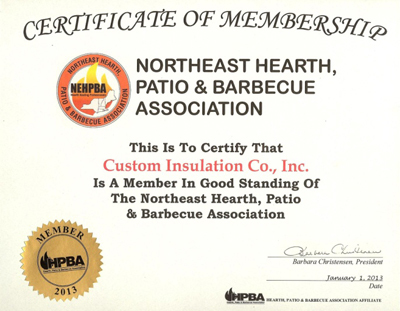 Custom Insulation Co., Inc. is proud to be a member of the Northeast Hearth, Patio & Barbecue Association and, by affiliation, with the nationally known HPBA. The Northeast Hearth, Patio & Barbecue Association (NEHPBA) is a not-for-profit trade association, and is known throughout the Northeast for promoting Safety, Quality & National Fire Institution (NFI) Certification Training. Custom Insulation Co., Inc. is always striving to bring our Quality & Service to the highest possible level. As part of our “Continuous Improvement” philosophy, we will be working with NEHPBA over the coming months to bring even greater value to you, our customer.